/ Going for gold: How data is shedding new light on the Olympic Games. If you’ve been following the Olympic Games in Rio, you know that this summer’s games have been one for the record books—literally. Michael Phelps became the most decorated Olympian ever—again—bringing in six more medals for a career total of 28. Katie Ledecky broke the world record in the women’s 800-meter freestyle, and won gold by what felt like an eternity: 11.38 seconds. Athletes from Puerto Rico, Singapore, Vietnam, Fiji, and Kosovo won the first-ever medals for their nations; plus, the 2016 Olympic Games is the first to have a refugee team competing. The stories coming out of Rio are nothing short of inspiring. Every day brings a new batch of highlights to consume, and many of these stories are being uncovered because of one thing: data. In fact, with the rise of open data, the amount of information coming out of the Olympics—and everywhere—is endless. Data journalists—and anyone, really—are able to gain insights into Olympic performance like never before. Even the athletes themselves are using data to improve their performance at the games. So who’s ready to dig into some Olympian-sized spreadsheets? Okay, so open data has given us access to countless rows of raw info, but sifting through row after row is a huge—if not impossible—task. That’s where Domo comes in. With just a few clicks, you can create easy-to-read visualizations that are much easier to analyze and interpret than a batch of numbers in a sluggish spreadsheet. Take a look at this Domo card. 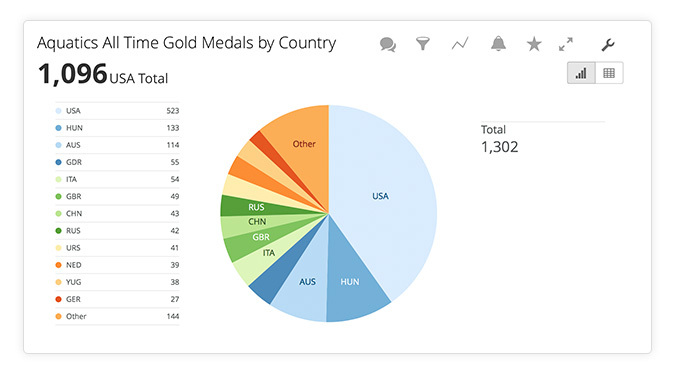 With Domo, decades of information—in this case, open data compiled from the Olympic database by The Guardian, can be transformed in just a few clicks to illustrate how the U.S.A. dominates the aquatic gold medal count. 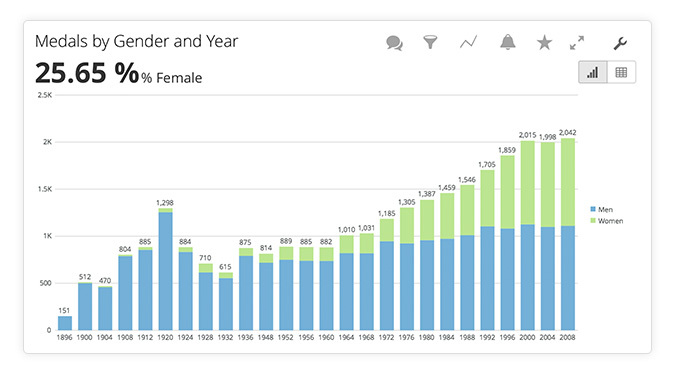 Or maybe you’re interested in exploring total medal count by country, or filtering medal counts by gender and year. Domo makes it easy to consume this information at a glance and quickly drill down for more detail. But what about all those medals still coming in from this year’s games? With Domo, you can take it a step further and build custom apps that update in real time to give you the most up-to-date info. You can even get alerts when something changes, like when another American wins gold. With that kind of data at your fingertips, you can also start to forecast what’s coming. Domo sorts through all the data you don’t care about, and gives you real-time access to the data you do care about, in a way that makes sense to you. But the Olympics aren’t the only place people are using data to analyze sports—and up their game. Check out the top-10 sports teams (and a few at the bottom, too), embracing analytics. 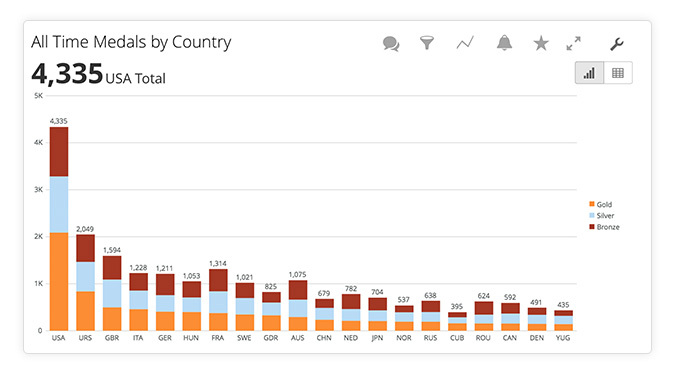 Ready to see how Domo can help you create cards to visualize and gain better insights from your business’ data? We can help you get started.